The Australian Dental Association is celebrating Dental Health Week during the first week in August, and this year’s theme is Women’s Oral Health. According to the Association’s website, “Its aim is to educate Australians about the importance of maintaining good oral health in every aspect of their lives.” Just as it’s important for women to exercise regularly, maintain a healthy weight and eat healthily, it’s also critical for women to practice good oral hygiene habits — at every stage of life. As an all-female practice, we can relate to the unique oral healthcare needs of our female patients. Did you know that hormonal changes can wreak havoc on a woman’s oral health? According to a recent study, many women don’t realise the critical impact that different life stages have on the health of teeth and gums. From puberty and menstruation to pregnancy and menopause, these significant times in a woman’s life can be accompanied by changes to oral health. The production of estrogen and progesterone take place during puberty. As a result, gums can become more irritated due to a condition called puberty gingivitis. Keeping this condition at bay includes brushing twice a day and flossing at least once per day. During a woman’s period, soreness in the mouth is often experienced due to elevated amounts of estrogen and progesterone. 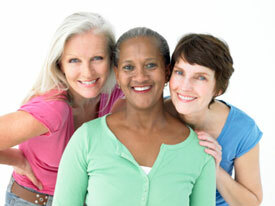 Some women experience bleeding, swollen gums. Continue to brush and floss each day to maintain a healthy smile. With pregnancy comes dramatic hormonal changes that can affect your oral health. For example, you may find that your gums bleed more easily. Again, keep up sensible oral hygiene habits during this momentous time of your life. During menopause, the significant drop in your hormone levels can lead to a number of issues including swollen gums and dry mouth. Ensure your teeth and gums are healthy at every stage of your life. Contact the practice today to schedule your next checkup!